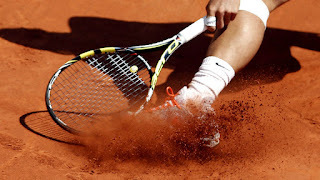 HALLE, Germany -- Rafael Nadal pulled out of the Gerry Weber Open on Saturday to rest ahead of Wimbledon. Nadal said the grueling physical demands of recent weeks, including the French Open, led to his decision to withdraw from the grass-court event. "After these past months and all the matches I have been able to play my doctors have recommended to rest after Roland Garros," said Nadal. Nadal said he would begin grass-court preparations a few days after his eighth French Open final. "We all know the transition is not easy and after these past months I have to approach this in a different way," the 27-year-old Nadal said. "It is a shame and regrettable that Rafael cannot come, but I can understand his decision," said tournament director Ralf Weber. "I know that it was not an easy one to take, but the player's health comes first." I won't be able to come to Halle this year, after these past months and all the matches I have been able to play my doctors have recommended to rest after Roland Garros and start after a few days my preparation to play on grass courts. We all know the transition is not easy and after these past months I have to approach this in a different way. I am very sorry for my fans in Germany and in particular in Halle since the welcome I always had there was amazing and last year, organisers also made me feel very special. They have made a very special tournament and it will be a success. I hope I can return to play next year for sure. Spanish:No será posible ir a Halle este año, después de estos meses y todos los partidos que he jugado mis médicos me han recomendado descansar después de Roland Garros. En poco tiempo, empezaré mi preparación para pista de hierba. La adaptación no es fácil sobre todo después de estos meses. Lo siento por mis fans en Alemania y particularmente en Halle. Siempre me dan una gran bienvenida, el año pasado fue increíble gracias a que los organizadores me hicieron sentir genial. Espero volver el año que viene seguro.